As you probably know, Sunday was the first day of Advent. As I joked in a post last year, Advent is not a new thing. If you are among those who see it as a “trendy thing the kids are doing”, among your New Year’s Resolutions should be to stop underestimating X’ers and Millennials ;-). Many younger evangelicals are trying to connect back to the ancient church and observing the church calendar is among the many practices that many evangelicals were not raised with. I am grateful that our church dedicates a portion of each service to light the candle(s) of the Advent Wreath but I fear that some worshippers may not see its significance and even worse, see it as something novel or cute. Advent means “arrival” or “coming” as my friend Evan explains in his Advent Booklet (you should download it because it gives an excellent and easy overview) and it invites the Christian community “to enter into the story of Jesus Christ. During this season one meditates on the coming birth of the Christ but also on His future Second Coming …”. For those who have been raised observing the liturgical calendar, you have come to realize that everyone observes it a little differently. Further, as you click around and do your own research, you will see a lot of disparity regarding practices, meanings, interpretations, etc. As a fan of plurality, this makes this observance less legalistic and also exciting for me. They key piece for why Advent became so necessary was celebrating it allowed me to reclaim the beauty and wonder of Christmas. I remember one Christmas in particular after aimless gift-buying, an underwhelming cantata/musical/singing Christmas tree and nearly overdosing on Christmas music, the first time I paused to meditate on the holiday’s significance was Christmas Eve night. There were feelings of unpreparedness and “missing out” stung my soul. Preparing my heart before Christmas was key and I became so thankful for the historical church’s practice. Here are some links for you to check out but I’d like to encourage you to commit to observing this beautiful season of expectation of our Savior’s birth. Everyday Liturgy, Thomas Turner has some excellent links and introductions for the longtime observer and for the newbie. Jr Briggs (a church planter in Doylestown) is posting daily advent readings for his congregation on his blog. The mobile Bible App YouVersion has an advent reading plan as well. Our family had a beautiful Thanksgiving this weekend. My sister, brother-in-law and niece flew in from Arizona and we spent the holidays with our parents, cousins and with many of our wonderful relatives. Aside from a possible knee injury sustained at our annual youth group football game, “Turkey Tackle”, (those junior high girls are tough), I couldn’t have asked for a better weekend. I even received encouraging words for the sermon I preached this morning (not sure if/how I will post about it but the feedback is surprising when you preach on the rich young ruler in such an affluent area. I mean that it’s surprising in a good way). I admit to being pretty sentimental these days. For the most part, things are good. I don’t just mean that things are good because God is good (though that is of course true) but I mean to include circumstantially – things are pretty good. I mentioned in today’s sermon that we have “good problems”. Everyone has problems, among ours are kids that wake up at 4 am and if they don’t, they sleep in til 5. Praise the Lord, they are healthy though that isn’t something we take for granted. A year ago we had to take our 6 week old Dylan to the ER and he was admitted into the infant ICU. Thankfully, he was only there a week and has been healthy ever since. We have had a couple of ER visits since (two with 2.5 year old), and have grieved the loss of a dear uncle and I have a few family members that I pray for throughout the day. Further, we have close friends and know of many others who are facing financial challenges, seeking employment, and trying to figure out the dynamics of certain relationships. May the Lord give us all grace. I don’t know anyone that lives a perfect, pain-free life – not one. I would also add that with the explosion of social networking and the new-found access into each other’s lives, again, I know of no pain-free lives. If you factor in round the clock, cable news coverage, twitter alerts, google news, (the only guy I know is that Dos Equis’ “Most Interesting Man in the World”). And so this gives me perspective. In your college years, you’re quite the idealist, in your mid-twenties there is the possibility of getting pretty jaded, now in my thirties, it seems that the two are balancing. In addition to our little growing family, here are a few things that I am thankful for. Some dear friends having kids this year – The Hickoks, Currys, and now the Turners. Within a month, 4 more couples that we love are going to have kids – going to be an awesome Christmas. A couple dear friends getting married – like the Peterhoffs! Our Sr. High Youth Group had a great mission trip to New Orleans this year and we are off to a great start for the year. I could go on and on but I am really grateful for our leaders, our students and their families. Grateful that I am making some quality friendships through our Second Mile Gathering. Our church’s prayerful search for vision. Some important changes need to be made in our hearts, ministries, and methodologies. Grateful that we have the courage and the motivation to address this. And again, I am grateful that God is there in the moments of pain, tragedy, need and among other places, confusion. Like everyone I hate the difficult days, and I grieve when others go through them (some dear friends and some I only know through things like twitter). I acknowledge that sometimes our attempts to comfort may fall short and sound trite but I am confident that the Lord is near the broken hearted. This was my first time hearing Phil Cooke. From all that he said, I was a bit surprised that I had not heard of him before but it’s a big world I guess. Phil does a fantastic introduction. First, he said, “My passion is to share the gospel more effectively.” In a room full of conservative evangelical leaders, that’s a winning line. Then to demonstrate evidence of a rapidly changing world, he drops this little stat, ““5 days of the NY Times is more information than people knew 100 years ago.” People at the table next to me smiled in disbelief and expressed their amazement. Clearly, the Church has not always been clear or helpful with our great message. Later he said, the first buildings to reopen in Afghanistan were not schools, hospitals, churches, – movie theaters. And so to cut to the chase, if we are going to have a voice to today’s generation (all across the world), we need to speak social media. He discussed the difference between the Boomer and Millennial Generation (and as an X’er this is always fascinating to me). The Millennial sees the interconnectedness of media. For example, they help pick the next American Idol by sending text messages. This is hard for the Boomers to understand. I immediately thought of Doug Pagitt’s sermon collaboration/giving at Solomon’s Porch. They may be seen as odd to some now but for similar churches and youth groups that are already experimenting with this, well, church and the idea of the sermon is going to look quite different years from now. Phil spent the second half of his presentation talking about “branding”. Even to me that’s a scary word, maybe another time, I can get into why but to cut to the chase, I think I have a fairly decent understanding of it from my time reading and discussing it at Biblical Seminary (Cohort 10! ;-) and agree that everything is branded. Whether branded poorly or well (and the many degrees in between). Everything carries a perception. And because of that – we brand in our youth ministry, our church, we even brand ourselves. I think this is an area that we need to be better stewards of and be more intentional about. (Yes, the website is an example and we all are in agreement that it needs to be radically changed professionally. Praying for change …). Cooke gave an excellent introduction to the need for social media in the church. I need to check out some of his books to get to the deeper things. I am curious of where he agrees/disagrees with the guru of it all, Marshal McLughan and what he sounds like in comparison with people like Shane Hipps. Branding Faith: Why Some Churches and Non Profits Impact Culture and Some Don’t, The Last TV Evangelist: Why the Next Generation Couldn’t Care Less About Religious Media and a new book coming out Jolt! Get the Jump on a World That’s Constantly Changing. On the heels of posting on Doug Pagitt’s Church in the Inventive Age, I thought I’d post a couple thoughts on the Collyde Summit that I checked out this past Saturday. First, I am still not quite sure whose Twitter feed I found the summit through but I thought that was kinda ironic since the theme was on the use of social media in the church. It gathered about 100 or so church/ministry leaders in north Jersey. Second, Collyde is an organization started by Jinu Thomas. He shared briefly about the launch of the Collyde network and you can read a little of his story here. In short it “is a “Socially-Conscious” social network for Christians, concerned citizens, churches and ministries around the world. Collyde is a non-profit organization that is committed to channeling 100% of net profits directly to fight social and economic causes around the world”. My first impressions of Collyde were pretty positive. Website looks great and the lineup was very impressive for such a small organization. Carlos Whittaker led a set of worship, Phil Cooke was the plenary speaker, an excellent panel discussion that I wished would have gone longer (and would have liked to have heard more from Joan Ball, she sounds like someone I’d really like to listen to). The event began with a presentation from Lloyd Pulley who is the senior pastor of Calvary Chapel of Old Bridge. He spoke on speaking the truth in love, how society gives an incomplete truth and the role of Scripture in our lives. Most in the room probably were not hearing anything new but his presentation set the tone and was a solid anchoring point. 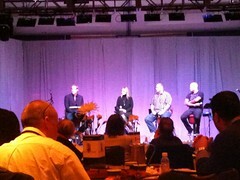 As mentioned, I enjoyed the panel discussion with Mike Leahy (Liquid Church’s New Brunswick Campus Pastor) Joan Ball (author of Flirting with Faith: My Spiritual Journey From Atheism to a Faith-Filled Lifeem>), Tim Abare (CEO of Big Fish Media), and Carlos Whittaker (whose daughter just broke her wrist, so please pray for her recovery). Whittaker is among the better examples of using social media. He is a gifted worship leader with a widely read blog called Ragamuffin Soul, a huge twitter following and has a personality that lends itself to social media. Mike asked him about one of his youtube clips that made his one year old son cry – you can watch it below, over 4.5 million people have. As the story goes, it went viral, the family ended up on morning talk shows, and they promoted the beauty of adoption and allowed other Kingdom-oriented opportunities. The takeaway was in what he said in response. He said he and his wife, Heather, post constantly, blog posts, tweets, videos on youtube and of the last 5 years, that was the one that blew up. It was the result of the platform and a number of other factors, not just a funny yet sad clip. He emphasized the importance of consistency in social media. Back to the panel discussion, as it moved along, there was a lot of humility (almost a “reverence”) to the topic and I really appreciated Joan’s comment, “No one really knows how to do this – we are all figuring it out, so use it, experiment, engage …”. I admit a bit of my reticence when it comes to my social networking. I blog a few times a week, tweet a few times a day and try to overpost and comment on Facebook for a number of reasons including, “This pastor is on his computer all day when he should be with people, praying, teaching teens, being more missional, with his family, waxing the steeple, etc.” And being a multi-tasker I do all those things simultaneously despite that we are a church that doesn’t actually have a steeple. But like everyone has said repeatedly, this is where people are many hours a day and pastors need to have a presence on here as well. Phil Cooke was fantastic and I’ll have to blog about him another time. The Youth Specialties National Youth Workers Convention took place this past weekend Nashville, will conclude today and this is the second year in many that I have missed it. YS has been a very important place/organization/community for me over the years and here’s why. That year, YS gave free registrations to those who had brought their youth groups to DC/LA and as one who did not have an adequate youth ministry budget nor was given the blessing of those in authority over me to attend, (A real quote, “Not only will I not give you the time to go, but I know you won’t like it”). I used my vacation time, Priceline, headed to Charlotte and met up with my friends Joel and Todd. What I didn’t expect was just how much I would like it. I could list the existential moments like driving down with Switchfoot’s Beautiful Letdown. Hearing Jon Foreman yell, “Are you who you want to be? This is your life …”, hearing the David Crowder Band lead, “You Are My Joy”, and attending an evening “brotherly discussion” and thinking, “Thank God for Tony Jones“. (Duffy Robbins was the other speaker in the discussion and I thank God for him too; I’ve been among the many who have profited from both men. It’s just that people like Tony were not only speaking my language but creating the language that I was trying to verbalize). Then on Monday as it was all ending I ran into Mike Yaconelli after he had finished speaking at the final session (which is still a bit eery because he would be killed in a car accident two days later). I know how this all sounds, cheesy with the Switchfoot reference, emotional with the Crowder sing-along, and fanboyish with the homage to TJ and Yac but it’s what it is. I was also fortunate enough to take advantage of the free career counseling that YS offered through veteran youth pastors. I’ll spare you from that too but I still consider it to be among the most affirming, life-altering words of advice anyone has ever given me. The entire event was much-needed and all I know is that I drove north with a bit of my mojo back (yep, we were quoting Austin Power’s then). This weekend I have been thinking and praying for those in attendance in Nashville, especially for the first-time attendees and for those who desperately need to be refreshed (and this may include the speakers/teachers themselves). From the Twitter feeds and blog posts, it sounded great and my hope is that many are getting back into the cars and boarding planes different than when they walked up to the registration tables just days ago. It also seems fitting to express my gratitude for Youth Specialties and the incredible people who work there. They have been through so much these last few years and from what I can see through the words of people like Tic Long and the web presence of Adam McLane, God is very much at work there. But back in the good old days, it was the pastor/priest that was among the most educated of society. While we are still fortunate to have the brilliant minds of people like pastor-theologians like NT Wright, Alister McGrath, Tim Keller, and countless others, I think there are some whose names that even the kind-hearted John Calvin would not quite equate with brilliance. Indeed, the role of the pastor and the type of pastor has changed over the years. Back in January I got to hear Doug explain this in the context of his analysis of the past 200 hundred years of American Christianity. I was sitting in Don Heatley’s church, Vision one Sunday night when Doug chronicled the changing role of the pastor. For obvious reasons, I was intrigued and it made great sense. The other part that made a great deal of sense was how he explained the nature of these ages: They exist simultaneously, build on one another, and have unique rewards systems. I mentioned the ages briefly in post 2 and here’s an outline of the pastor’s role in each age. The Agrarian Age (the Little Church on the Prairie) is what you think it means – the little white church on the hill built my the good-hearted people of the town. For those living in the early 1800’s, much of life was about survival and depending on one another. Most likely, there was one church in the area and theology was secondary to geography. The pastor was the shepherd of the congregation, the “moral compass” and tended to the needs of the flock. Doug mentions that even today there are Agrarian church exists in downtown Parish style churches in many urban centers like Los Angeles and Minneapolis. In the Information Age, the educational aspect evolved and Doug lists that churches offered learning centers offering parenting classes, marriage seminars, women’s Bible studies, men’s devotions, youth groups and preschools. “While your denomination still mattered, the real test of a church was what you learned there. If you weren’t learning anything, you left. Non-denominational churches exploded onto the scene, focusing on the soundness of their teaching techniques and the correctness of their content …. The Information Age gave us the pastor as teach and eventually pastor as CEO. his sermon topic was advertised on a sign outside the church – it was the message, the lesson for that day that was important …” (p. 23). In the Inventive Age, the role of the pastor of course will still teach, preach, lead a church, etc. but the pastor will need to be able “to create and facilitate open source faith experiences” for the people in the faith community. Said another way, the pastor’s role will include facilitating and networking skills. That’s exciting to me and worthy of a separate post later. Though I think many pastors can understand Doug’s reasoning, I believe it makes a lot of sense to those serving as youth pastors. A huge part of the responsibility is to care, teach tradition and practice, and facilitate. Many of us are quite accustomed to teaching and breaking into discussion groups allowing the listener to not only share what they have learned but also share what they disagree with and/or not like. Doug’s personal ministry takes it a step further as his community is also an active part of the sermon. Sitting in circle of couches, they interact not only with the one giving the message but with the person on the other couch. Indeed, I think many youth pastors are among those that will have an easier time with the ideas of the Inventive Age. I learned yesterday that Doug’s mother passed away late Wednesday night. I’m not sure I will get over how easy it is to be in touch with people that seemed unaccessible prior to the internet generation. Initially, I thought of not posting about the Inventive Age this week, because I was afraid it seemed trivial and maybe even insensitive. This morning I woke up and thought the opposite. He posted a brief and beautiful thought this morning – thought I’d share it with you. It’s in these days that we ought to never hesitate to share beautiful stories, important truths, and share needs with one another. So to you who read this, I’d like to ask you to pray for Doug and the Pagitt family. May the God of comfort and peace be with them during this time. 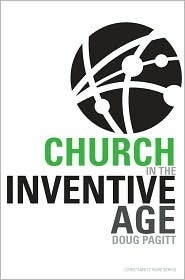 As mentioned in the last post, I think everyone interested in the future of the Church should read Church in the Inventive Age by Doug Pagitt. While there are a lot of other great books you could read as well, this one is very brief and in my opinion, provides a clear perspective on why the Church needs to invest itself in change. “It’s only a slight exaggeration to say that everything in our lives, everything we depend on for basic survival was created in the last two hundred years. Think about your typical day. You wake up in a bed made of materials – internal springs, polymers, anti-microbial fabrics – that didn’t exist 200 years ago. You are awakened by an alarm clock that was invented in 1876 (or maybe an iPod that was invented in 2001). You take a shower (indoor plumbing arrived in the mid-19th century); eat eggs shipped by trucks from a different part of the country, purchased at a grocery store with a credit card, and cooked over an electric stove. You drive a car to work and maybe make a few calls on your cell phone on the way” (p. 3). “In the last 200 years, American culture has moved through three distinct ages – the Agrarian Age, the Industrial Age, and the Information Age – and is heavily engaged in a fourth – an era I have dubbed the Inventive Age. 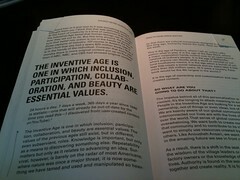 With each of these ages has come a shift in what we think, what we value, what we do, and how we do it” (p 4). “I’m calling us to find our place in a swiftly changing culture, to consider how we need to change what we think, what we value, what we do and how we do it. I’m calling us to be the church in the Inventive Age” (p. 5). Aside from institutional aspects like marriage and so forth, I cannot think of one aspect of my life that I am using that was around prior to 200 years. From the way I drink coffee to the way I interact with others, indeed everything is different in some way. Every so often when I am discussing this, someone will be quick to remind me that “There is nothing new under the sun.” In moments like these, I would like to take the literal scroll of Ecclesiastes and hit them over the head in hopes I can beat out the strict literalism in their mind. Unfortunately, no one reads from scrolls anymore – we have been using books and e-readers now and these objects are prone to bruising (Actually during the Davidic/Solomonic Kingdoms, scrolls, papyrus, and codex were used together – Go Egyptians! And I do expect an archeologist to dig up an ancient Egyptian Kindle any day now). Still, the printed book, e-reader, the engine, and countless other inventions would have been new to the “The Teacher” of wisdom and frankly, this is not what Ecclesiastes means when saying there is nothing new. Seriously, for those especially who tend to tune out upon hearing the words “new”, “change” and “rethink”, this is an important era in the life of the Church. And like very era, we need to be faithful with it. I would like to convince you that it does not undermine our faith in God, the Scriptures or the leading of the Holy Spirit to see the Church and live out our calling in new ways. In fact, we have been doing it throughout the Church’s history. It would be wise for us to search the ancient ways of the Church and to discover new ones. Doug does an excellent job launching from here and I think once we clarify certain assumptions, a bright and hopeful age becomes possible. Back in August, I read Doug Pagitt’s latest book, Church in the Inventive Age. It’s excellent. And I have been waiting this long to post it for a few reasons. One is that I procrastinate, sometimes on good things. But the other reason is that I wanted to make sure that I posted it as the blog was moving in a “future church” direction and what better time for those in my local context than now as we move forward after celebrating our 50th Anniversary? It’s true that I am biased towards appreciating Doug’s work (everyone is biased towards something you know). As one who spends a lot of time working on the problem of why our churches are shrinking, Pagitt is among the few that have insights and answers worth pursuing. Perhaps one of my greatest admirations of him is that he is truly not afraid to question. I think I can only say that about a handful of people. That said, this does not mean that every question he asks is a good one, but many of them are. So when Doug asks, What should the Church look like in the future, I’m interested in that conversation. But before we jump to the present, Pagitt takes the reader on a quick crash-course on the last 200 hundred years of American Christianity. He divides the years into four ages: Idyllic, Industrial, Informational and presently, the Inventive Age. I don’t think that I have ever seen a better and more concise explanation of that material. I plan on blogging about this a little more tomorrow. Anyone interested in the future of the church, especially those who do not understand how we got to where we are. For those new to Pagitt or these conversations, this is the easiest book to begin with. Isn’t Pagit one of those “emergent” guys? It’s true that Jesus is Lord – that will never change and no one is contesting that. However the proclamation of the Gospel is ever-changing. And while we can debate the success-failures of the last 50-60 years, i think we’ll see that the proclamation of the Gospel was faithful to that age. Thus, copy and pasting that proclamation to today’s world is not helpful. It’s like fixing a new Toyota Prius with the parts of a ’56 Bel Air. I think one of my pastoral, (if not Christian), duties is to lead people in a necessary direction. Among other Christian disciplines, I try to read a lot of books, I like a lot of them and I try to share the knowledge and hopefully the application of them. And like many, I see things like social networks, blogs, etc. as an extension of the ministry so as always, thanks for taking the time to read here and I hope you consider reading The Inventive Age. You should change that. Reading is an essential habit for the growing Christian. Read the Scriptures and read this book, it’s an easy 2 hour read and it’s worth it. Order it here through Amazon or here at Augsburg Fortress for a discount on bulk orders. By the way, Sparkhouse did a fantastic job on this book and I look forward to reading their other titles. Not only is the book is aesthetically pleasing in its cover, easy readable text and chapter display, it’s got a great physical feel to it (take that digital version! ), and big quotes in case you missed the good stuff – seriously they did a nice job. Also, if you are a youth pastor or involved in vbs, you should check out some of their curriculum here. Truly I enjoyed attending Friday’s evening Pastor-Elder-Anniversary Committee Meet and Greet (not it’s real name) at the home of our senior pastor. There may have been 50 people in the house and so conversation with everyone was not realistic but I did enjoy the interaction with the former pastors. I especially loved hearing the phrase, “So you’re the guy who …. (laughter, laughter,)” One of the couples I especially enjoyed meeting were the Rodquists. Dave was the first youth pastor of MEFC 35 years ago and also gave a fantastic message at the men’s luncheon Saturday morning. I wish them nothing but the best as they continue serving at their church in Minneapolis. The Men’s Breakfast was excellent too; loved the table I sat at. I was also blessed by those who continue to serve the breakfasts (Sam, Scott and the many volunteers). Though I wish they’d learn to serve some cappuccinos too :-), it’s always a great meal. The BIG Reception was extremely well-planned, well-executed and well-received by all. I won’t waste the space talking about the appetizers and the squash soup, entree, etc. but know that it was all good. What I particularly enjoyed was the video presentation telling the history of our church. Very well done and I was grateful they gave a DVD of it as a gift. There was some solid preaching throughout the weekend. Pastors Doug and John certainly brought Christ-centered, challenging words to us. Still loved by many in throughout our church, it was great for newer people like myself to have this connection with them. There were moments that revealed the generational differences but that’s what you would expect at a church anniversary. It’s hard to please everyone on a weekend that was to encompass 50 years. Personally, I felt that we could have done a bit of better job telling the story of the last 10 years and I do not mean that as a harsh criticism in any way, simply as one who has been attending for the last 5 years, it was obvious to me and people similar. That said, I did appreciate that our current senior pastor was honored and I was truly grateful for the telling of the rich history of our church. I was personally moved by the pastors who had served and loved our church over the years. It’s true that they are just men and there is always risk of the over-glorification of mortals but they are good men and I trust they are committed to the Spirit’s leading. Pastor Doug is a special person, the type of guy you could listen to all day. And Pastor John reminded of a professor I had at Liberty. It was also touching to see Pastor Bob Hickman honored throughout the weekend and that was special as there was a lot of question of whether he and his wife Ruth would be able to attend (due to distance and the challenges that age has brought). Though I came after his vocational ministry, it is clear that they have both taught our congregation a great deal including more recently, lessons in aging graciously and having a marriage that cares for the other. These pastoral moments were beautiful reminders for me to never take the calling of pastoral ministry (and all that is connected to it, like marriage and family) for granted, may the Lord keep me and all who serve near. We were also blessed by our most recent former youth pastor, Joe Hensler who now serves as the senior pastor in Free Church in Allentown. He honored Pastor Bob as well and he also gave special tribute to our beloved Dr. Dave, calling him a pastor to pastors. Doc has met with every youth pastor almost every Wednesday morning for the last 10 years. Joe is right, he is a good, good man and we are all blessed to have him. Joe also encouraged the church to continue investing in young people, as he gave testimony that it was his time at MEFC that was quite pivotal for him, his family and his ministry. Like I said, not everything and everyone got mentioned. We arrived in 2006 when Pastor Mitch was serving. If you have ever heard me talk about Mitch, you know I regarded him as one I truly admired and wished we could have served longer together. His exegetical messages are among the best I have heard. I have no ill-intentions when I say this but this man does not get the credit he deserves. The Lord worked through him in many profound ways and there were a lot of courageous moments in his ministry that are still reflected at Montvale today. On a personal note, this being my second church (and thus going through the process of healing from the “first church experience”) is something I will never forget and Mitch was a huge part of that for me. I’d say besides my wife, my parents, and those that have known me a while, he and Doc were the first to believe in me and my philosophy of youth ministry (it’s not really that radical, it’s anchored in disciple-making but that s another story). Susan and I miss him and his wife Faith, we’re happy for them and where they are and we are happy for our current pastor, his wife and family. I have always been blessed by the fact that there are so many wonderful people serving in the Kingdom of God. Sunday’s service was fantastic as well. The choir was brilliant (reminded of Easter ’09); we even had handbells and they sounded great too. Extremely special was our time of communion. We are not a high liturgical church but we take the Lord’s Supper seriously. Aside from an evolving love for it, it’s really the only practice that has not changed in methodology for me and I was honored to help serve the sacraments. As one who enjoys many types of changes, I have always found peace in coming to the Lord’s table. The “Anniversary Committee” did an amazing job through and through. Further, there were probably over 100 people who helped make this weekend happen as special as it was. I find this especially encouraging because I believe one of the lessons that I think we collectively walked away with was if we can make this as fantastic as it was, we can do anything for the Kingdom … and we better. The future of the Church of Jesus and the future of this church are the topics that occupy my mind quite frequently. This blog is a reflection of that and may my ministry be as well. Indeed there was much to receive as we looked back and now let us move forward. May the Spirit lead each of us as build the Kingdom of Christ in our homes, our community and in our world.